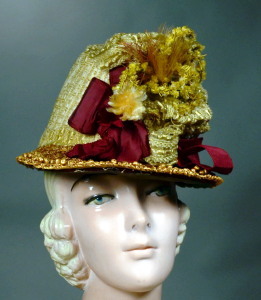 1880's vintage high crown hat. Ecru silk with wool, dark golden straw and yellow gold & rust foliage. High crown draped with textured stripe silk & wool fabric and gathered at center front. Textured straw asymmetric brim with little straw balls on top of brim. Chenille & straw foliage. Large wine colored bows front left and right, 2 1/4" wide ribbon. Velvet and lace edging at under brim. Pieced cotton lining. Crown height - 5 1/2"
Brim front - 2 1/2"
Very good condition, issues are consistent with age. Hat shows some moderate wear throughout. Fabric at crown shows some fraying in areas. Inasmuch as the fabric covers crown top it will remain intact because it is not disturbed. Some edge breaks in brim, some balls missing and discolor & wear at underbrim. Hat is not perfect, but presents well and would be excellent for display or study.